Accuweigh recently sold a Japanese made, Fuji-Ace Palletising Robot and a locally manufactured palletising and conveying line to the Lismore branch of Norco Agribusiness. Accupak (Accuweigh’s manufacturing division) designs and locally manufactures complete palletising lines to client’s specs and it was these advantages that assisted Accuweigh being awarded the robot palletiser supply contract. the flexible design layout allowing all the palletising equipment to fit into the existing floor space available. 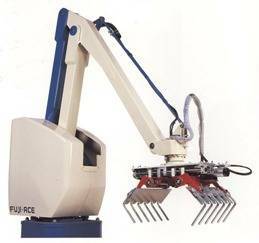 all other supplied components (apart from the Fuji-Ace Robot Palletiser) are designed and manufactured in Australia by Accuweigh’s own manufacturing division, Accupak Pty Ltd.
local backup and support with trained staff in all major Australian cities, including Newcastle. Accuweigh’s ability to meet the short time frame for commissioning the palletisiing line. System Installation, Commissioning & Operator Training: Accuweigh will undertake all these tasks at a time to suit the client. Norco Agribusiness markets a range of quality animal feed products under the Goldmix Stockfeeds, Crest Seeds, Goldmix Seed & Grain First for Quality and Meat-e-Vite brand names. The Lismore (Northern NSW) site manufactures and delivers a range of pelleted and mash feeds for all animal types including laboratory animals. Bagged product is distributed through the Norco Rural network of stores as well as other resellers.